How many times have you gone down into the basement, into the back yard, or into your garage and found a hopping creature that looks like a spider and has the legs of a cricket? (usually this is followed by screaming or impolite words). This leaping creature is the camel cricket, a nocturnal insect in the order Orthoptera and the family Rhaphidophoridae (Rap-he-doe-fore-a day). They are light tan and brown, about 1-1 1/4" long, and they don't have wings (so no worries about flying). Camel crickets are related to cave crickets and occur across the US, all continents, and most islands. They like moist, dark, and damp environments which explains why you find them in garages and basements. The most common species here in the US is the Spotted camel cricket but researchers are finding that the Japanese camel cricket is also starting to invade our homes too. 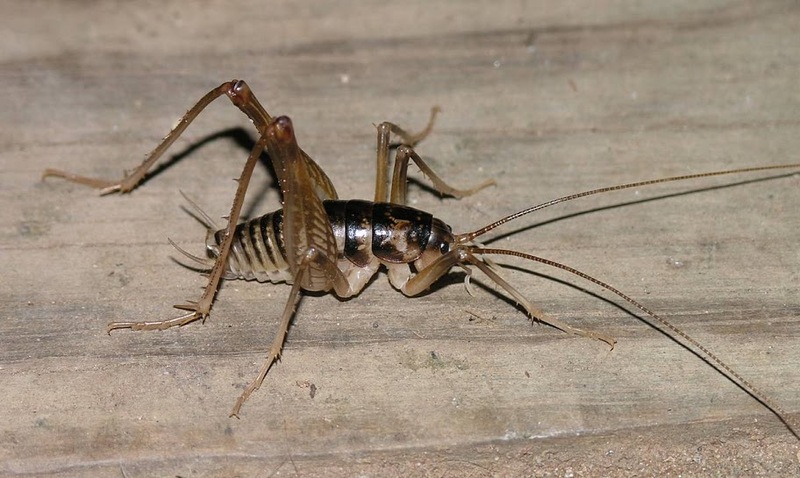 Posted in Invertebrates and tagged Camel Cricket, Camel cricket infestation, Do camel crickets bite, Spricket, weta on November 22, 2013 by Infinite Spider.